Another demo post I've had in the hopper for a while! I like the look of a checkerboard pattern, but it can be a little too tight for my liking...and also (truth now!) a lot of work, to brush slip on each individual square. For a checkerboard pattern that's a little more dynamic - and also easier to achieve - I sometimes use squares of cut newspaper. 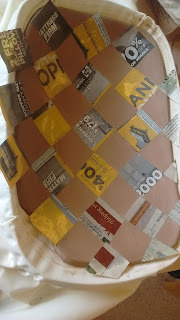 I cut several layers of newspaper at once. I don't usually measure but cut squares (or "almost" squares) about 2" each side. 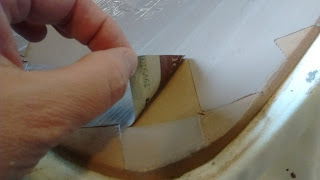 Go around with a fingertip and make sure there are no wrinkles or bulges at the edges that slip can get underneath, and that the squares are stuck down well. Brush your slip over the surface. The brush strokes will show, at least a little, so consider that when you are applying your slip. I usually brush all in one direction. When your slip has just begun to dry - just enough for the shine to fade - you can start removing the paper. 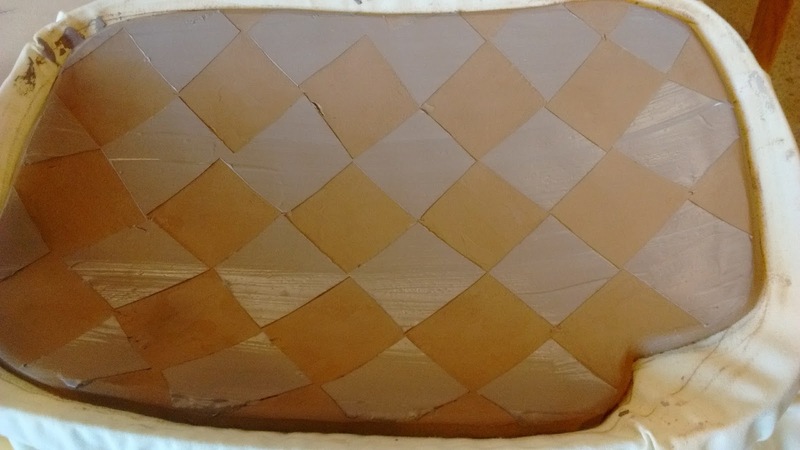 The edges will be easy; for the inner squares I use a needle too to get underneath them to start peeling. Since I started this blog post, like, a year ago, this piece is long since finished & gone. I glazed it with ^10 shino & fired it in Portland Pottery's stoneware kiln. 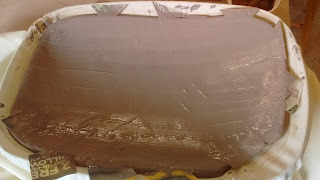 The slip fired to a blue-y black, the bare clay a yummy rust brown. Obviously a transparent or translucent glaze is a good choice here. You could, of course, use any shape for your paper resist. With some care you can even do relatively delicate shapes. Torn paper makes for a nice dynamic line. Look What We Did, Together!